Here's a new, edited, and improved version of a Christmas story I wrote a few years ago. Merry Christmas! My four-year old daughter tugged at my sleeve and pointed. “Look Dad. It’s Santa!” she whispered. 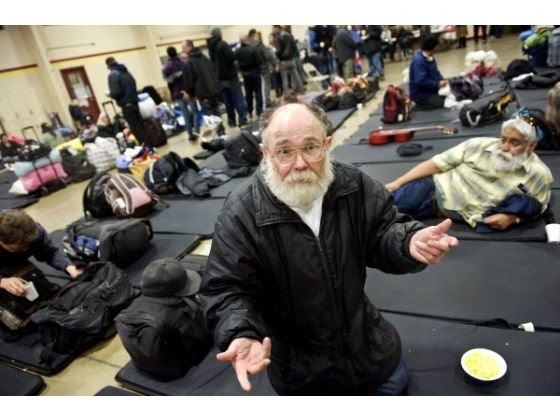 I looked up from serving soup in the homeless shelter and saw an old man with a bushy white beard holding a soup bowl. Except for the tattered army jacket and his unkempt appearance, he did look just like jolly old Saint Nicholas, minus the jolly part. “Santa Claus?” His face was blank. No jolly laugh. No twinkling eyes. No ho, ho, ho. “Yes, because I am Santa Claus.” He stared back at me in a way that made feel transparent. The old man stared at me with the same deadpan look. “Ho, Ho, Ho,” he said as he took his soup and moved on. I continued to serve soup to the others, but couldn’t take my eyes, or mind, off of the Santa look-alike as he sat by himself and ate his soup. When I finished serving, I sought him out. “Like a bowl full of jelly.” He stared at me with that same blank expression. My face flushed and I looked away. “I guess you’ve got a point,” I mumbled as I stood to go. “Merry Christmas.” I stood and walked away with my tail between my legs. Over the next few days the conversation with the homeless Santa troubled me. What should I do? How could I help? He was right, I didn’t believe in Santa, but I did believe in helping my neighbor. So when my boss asked for Christmas party suggestions, I got an idea. I told everyone at my office about my encounter with homeless Santa and asked if we could sponsor him. We could take up a collection to buy him new clothes, help him find some temporary housing, and a buy him few Christmas presents. In return he could come play Santa at our company party. Everyone loved the idea. It was a wonderful party. Homeless Santa had ditched the tattered army jacket and cleaned up his beard. He came dressed for the part with the traditional red suit, black boots, and bag full of toys. He was the life of the party as he gladdened hearts with his rosy cheeks and his hearty “Ho, Ho, Ho!” He had a magical touch with children, and my daughter beamed as she sat on his lap. By the end of the night, we all believed in Santa Claus. As the party finished and we gave him our gifts, he cried openly at our generosity. We joined him, but they were tears of joy. Everyone called it the best Christmas party ever. That Christmas Eve, my daughter and I put out milk and cookies for Santa and waited together by the fire in my big leather chair. Of course, we both fell asleep long before the clock struck midnight, and missed our chance to see the jolly old elf. But the next morning the cookies and milk had been replaced with a note. Have you ever felt inadequate? Maybe you felt like you didn’t quite measure up, or like everyone else was better than you at some particular task. You looked around and saw yourself lacking when you compared yourself to others. I feel that way every time I sit down to write something new. The task humbles me and makes me dig deep within myself for courage. Self-doubt is the enemy of accomplishment. Have you ever bragged about your abilities or felt so confident that you were smug in your approach to a particular challenge? Maybe you even believed that the task was so far below your abilities that you did little to prepare. You almost felt insulted that someone with your talents and skills was asked to perform such a menial thing. I know what that feels like as well. It takes a great deal of arrogance, even hubris, to write something intended to help others. Arrogance is the enemy of excellence. A few years ago I was at friend’s house for a get together. His son had just returned from two years of missionary service for the LDS Church in Peru and we were celebrating. It was heartwarming to see a son reunited with his family. The celebration also sparked a nerve with me, a lurking emotion that had niggled at me for years. It reminded me of how lost I felt when I came home from my time as a missionary. Those awkward feelings of grief and loss mingled with the joy of returning home are a strange combination that lingered with me for years. Many young men and women in our church serve as missionaries. Currently over 85,000 young men and women are serving worldwide. It is truly an amazing statistic when you think about all the things these young men and women could be doing with their lives. No matter what your religious beliefs, you have to admire their dedication and sacrifice. But what do they do after that sacrifice? Who do they become? How do they transition back to normal life after such incredible missionary experiences? His candid, no-nonsense approach to the problem hit me in the face. Like any good coach he didn’t just nod his head and commiserate with me. He assessed the situation and then told me what I needed to do. His call to action stuck with me, and I thought about the idea for weeks. It hit me with incredible energy, and I couldn’t stop thinking about it. I felt prompted to move on it, but self-doubt crept in. After all, who was I to write advice for returned missionaries? I’m not an expert. I have no credentials. I pushed the task aside for almost two years feeling inadequate and unworthy to accomplish it. Perhaps I felt unworthy of the project because my writing journey started out of sheer arrogance. I waltzed into the world of writers with overconfidence and arrogance only to be humbled by the craft. I know firsthand the cost of hubris. I understand all to well the price for arrogance. I certainly didn’t want to approach such an important project with pride driving me forward. The idea lurked in the back of my mind but from time to time it would thrust itself into front and center, but each time my feelings of inadequacy pushed it back into the shadows. My wife Britt kept prodding, almost nagging, me to get busy and write it. She knew I could do it. She saw my passion for the topic. She believed in me when I didn’t believe in myself. Eventually, I was asked to work directly with the young men and women returning home from missionary service, and I could no longer ignore the promptings. With the faith of my wife behind me, I started the project. It went slowly because of my internal battle between self-doubt and arrogance, but eventually I finished something I deemed worthy of sharing with others. In an effort of improve the product, I sent the manuscript to my publisher. I hadn’t published any nonfiction, so this was uncharted territory. I was humble in my approach (not necessarily the best approach for building confidence in your publisher) and offered to work with anyone else who might be writing something similar. I still felt that surely someone else would be better qualified to publish this advice. When Emily from Cedar Fort emailed me and offered to publish the book, all those feelings of inadequacy came crashing down on me again. I was terrified that my efforts would not measure up. My deadline was also very tight. This time, instead of running away, I reached out to my family and friends and asked for their specific prayers. I swallowed my self-doubt, along with my arrogance, and with heaven’s help I finished the manuscript on time. To say that I wrote this book would be a lie. I put it together, but I pulled from the wisdom of friends, family, and Church leaders. I also felt the guidance of the Spirit through the process. Both self-doubt and arrogance can destroy any successful endeavor. Both are distortions of the truth, like some caricature drawing that exaggerates a particular feature to the point of dominance. Both are false emotions that can keep us from becoming the best we can become, or from doing the best we can do. If we are to become or achieve anything worthwhile we must deal with these two enemies of success. It has been over thirty years, but I can still remember that empty feeling I felt when I walked off the airplane after my mission. I hope that this book will make it easier for all the wonderful young men and women coming home to deal with the transition from full-time missionary to faithful returned missionary. 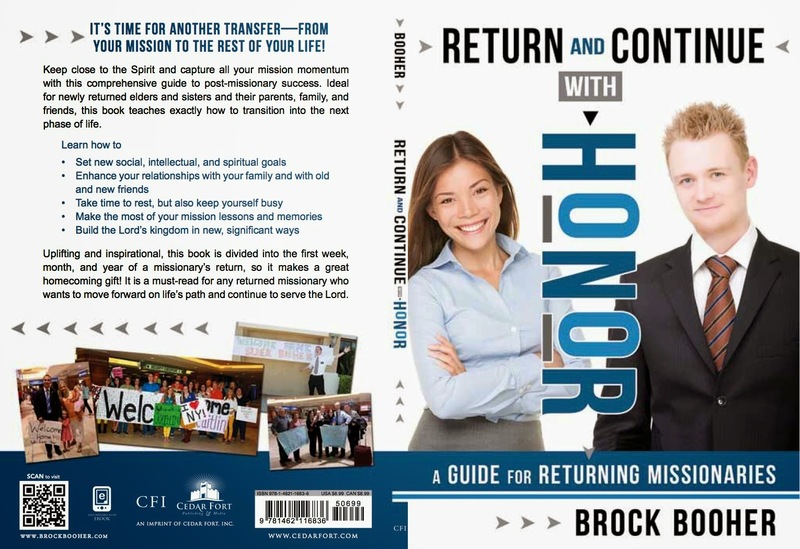 *** Return and Continue With Honor will be released on February 10, 2015 and will be available Deseret Book, Barnes & Noble, Amazon, and other book retailers. 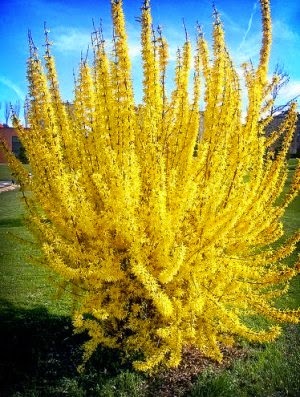 It would an understatement to say that I have been busy, but that still is no excuse for not posting a blog last month. I recently participated in a writing exercise using Storymatic, a group of cards that are used as story prompts. I chose the following random cards - 1) Write the story in the 1st person 2) Pilot 3) Someone who just got out of prison 4) Unopened envelope 5) Overdue apology. With those cards as my story prompt, I wrote the following short story. Enjoy. It took exactly forty-seven seconds for the prison door to slide open. After spending six years, four months, fifteen days, ten hours, twenty-three minutes, and thirty-nine seconds behind bars, you would think I learned patience, but you’d be wrong. I learned to wait. Patience is different than waiting. My lawyer was there to greet me with his politician’s smile when I walked out a free man. “How does it feel to be exonerated?” he asked. I stared right through him for five whole seconds but didn’t answer the question. He had never served time a day in his life and nothing I could say would make him understand. On top of that, his efforts didn’t set me free. While he cleaned out my savings account, I gave information to the Feds until the case broke, and they arrested the real criminals. Now he wanted to stick me in front of the cameras and bloviate about saving innocent people. I never even smiled for the camera, and saved my energy for more important matters. She was Beatríz – chocolate skin, brooding black eyes, and even blacker hair. She told me she loved me. She told me she wanted to marry me. I believed her, right up to the point when she betrayed me. I wanted to see her too, but not to apologize. I jumped in a cab and headed for the rendezvous location so I could hear her apology, or something like that. The sky was a crisp blue with puffy white clouds, the perfect kind for cloud chasing, just like the day they hauled me to jail and clipped my wings. All I ever wanted to do was fly, but jailbirds don’t fly. They flap their wings in the yard like some fat chicken, but never get off the ground. Beatríz had betrayed me, and her betrayal kept me on the ground for six long years. Now it was time for payback. The cab pulled up and I saw her sitting in front of the Starbucks with sunglasses on. She stood when I got out of the cab, and for a moment I thought she was going to rush over and hug me. I think the look on my face stopped her. She took off her sunglasses when I walked up. “Hola Jack, it’s good to see you,” she said. I stood there with my arms folded and didn’t say anything. I glared back and sat down. I was trying to decide if a Starbucks cup could be used as a deadly weapon. Several other people sat at nearby tables engrossed in their phones. I wished I had insisted on meeting somewhere private, someplace without cameras, or witnesses. I was happy to see a tear roll down her cheek. My rage searched for a way to extract revenge on the spot, but six years of learning to wait kept me from it. I waited at least a minute for her to speak. I stood there grasping the table and clenching my teeth as hot breath surged in and out of my nose. She put her face in her hands and began to sob. I wanted to somehow extract six years of pain in sixty seconds. I noticed that a man sitting nearby stood and began recording with his phone. I glared at him, like only a convict can, making him cower and mind his own business. I released my grip on the table and sat down again. I checked my watch. I had waited six years, four months, fifteen days, twelve hours, forty-one minutes, and eighteen seconds for this encounter. The exact moment of my revenge had arrived and in the end it felt more hollow than an empty prison minute. I looked up at the sky, the delirious burning blue, and longed to escape the heavy emotions that had kept me on the ground. I realized that revenge would only serve to ground me again, and I could never spend another second as a jailbird or another minute unable to fly. The moment I had waited for was not to be filled with revenge, but with release of the past that weighed me down like sandbags on a hot air balloon. My pale hand trembled as I reached out for the sealed envelope. A knot formed in my stomach and worked its way up my throat as I tore it open and revealed the photo. I cradled the photo in my hands and gawked at the almost six-year old face of my son. He was holding a red toy airplane. Time flies. My son had been alive six years the first time we went flying together. It was worth the wait.